It was 11 years ago today that Sandra Day O’Connor announced her retirement from the U.S. Supreme Court. On July 1, 2005, Justice O’Connor announced her retirement in a letter to President George W. Bush. 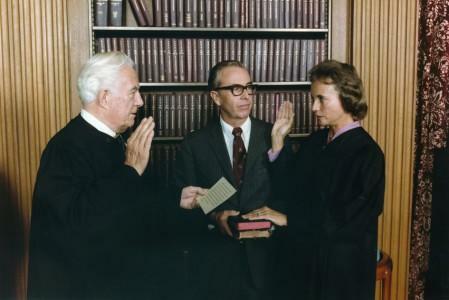 As President Ronald Reagan’s first appointee, Justice O’Connor joined the bench in 1981 as the first female justice to sit on the nation’s highest court. At first, progressives around the country applauded the appointment, but feminist enthusiasm quickly cooled when, in her first year on the Court, O’Connor earned a reputation for joining the well-established conservative alliance between Justices Warren Burger and William Rehnquist. Throughout her early years on the bench, journalists and commentators consistently described O’Connor as a “classic conservative.” As Chicago Tribune staff writer Stephen Chapman wrote in 1986, she was a member of a three-member conservative bloc, voting alongside Rehnquist and the newly nominated Antonin Scalia, set to replace Chief Justice Burger. However, as her judicial experience progressed, critics and supporters alike began to take note of the justice’s burgeoning independent streak, and by 1992, with her decisive fifth vote in Planned Parenthood v. Casey – striking down a Pennsylvania law requiring spousal awareness for an abortion – O’Connor established herself as the Court’s key swing vote. As she entered the second half of her tenure on the Court, journalists began to identify O’Connor as a moderate, and by the last quarter of her judicial career, she was regularly described as a centrist, a moderate centrist, and even, as Lyle Denniston wrote in 1999 for the Baltimore Sun, a “moderate establishment progressive.” From 1993 to 2005, more than a quarter of all Time and Newsweek articles discussing Justice O’Connor labeled her as a swing voter. Such politicized discussions of O’Connor’s jurisprudence coincided with a more general politicization of the Supreme Court in the waning years of the last century. Scholars Norman Gross and Leonard Vieire point to the nomination proceedings of Judge Robert Bork as the impetus for this shift. President Reagan’s 1986 nomination of Bork to the Court, they write, was met with unprecedented opposition that played out during his confirmation hearings. The process lasted nearly 87 hours, with Bork himself testifying for more than 30. These hearings, argue Gross and Vieire, became the lens through which subsequent proceedings would be viewed, and created a public perception of the Court that was more highly politicized. The Court’s 2000 holding in Bush v. Gore has been cited as evidence for this politicization of the bench. Steeped in controversy, the opinion served to determine the outcome of the 2000 presidential election by stopping the re-count of the Florida electoral ballots and upholding the state’s ruling in favor of Bush. Prior to this decision, justices had erred on the side of caution and ruled such controversies as beyond the authority of the Supreme Court. As this more political bench emerged, O’Connor placed herself at the center, and thus became one of the most powerful justices at the time. Lawyers focused their efforts on persuading her, and the public looked to her as a weathervane for the ideological swing of the nation. Justice O’Connor’s 2005 retirement, then, prompted broader conversations about the need to uphold both the diversity and political stability of the Court, and led to divisive public discussions about her successor. When President Bush nominated Harriet Miers to fill the vacant seat, legislators across the political spectrum voiced unease. While such concerns were often couched in questions of Miers’ judicial capabilities, many commentators note that it was ultimately controversies over her views on such issues as abortion and affirmative action that prompted the removal of her name from consideration. Though the Supreme Court nomination process has always been political – the sitting president, a political figure, is charged with selecting a justice and the legislature, a political body, is charged with confirming – in recent years the American public has watched the process with an increasingly critical eye toward implications for social issues. The legacy of O’Connor as both the first female justice and as a critical swing vote on an increasingly politicized Court could serve as a barometer for future conversations over the judicial appointment process. Norma Gross and Leonard Vieiri. Supreme Court Appointments: Judge Bork and the Politicization of Senate Confirmations. Carbondale, IL: Southern Illinois Press, 1999.